Nesco FD-80A Square-Shaped Food Dehydrator is one more product from the well-known company “Nesco”. This appliance is very affordable as well as an easy-to-use that is designed to create rapid outcomes in very less time. It is not only compact in size but also impeccable for a person who desires to make some delicious food in a dehydrator at home. Due to its reasonable rate along with the simple effective features, this food dehydrator turns out to be one of the perfect machines for the person who has never used a food dehydrator earlier. The Nesco FD-80A Square-Shaped Food Dehydrator also help you in simply avoiding the toxins and chemicals which are quite often found in commercially-factory-made fruit rolls as well as dehydrated vegetables. With this appliance, you can save the lot of money that you might have to spend on buying your favorite dehydrated foods from the market or a store. ​Our medical professionals always recommend consuming more and more fruits as well as vegetables each day so that our body can get enough nutrients and minerals from them. So, with the help of this food dehydrator, you do not have to daily go to the market and buy fruits for yourself that are seasonal also. You can simply dehydrate them and preserve it in an airtight container for longer time period. In fact, kids also like to consume these types of snacks that are crunchy and delicious to eat. Besides these benefits, it is one of the best-looking appliances that will perfectly suit the countertop of your kitchen. ​As compared to the other models, this alliance devises a system of horizontal air flow along with a fan that is fixed at the top. Due to its outstanding design, the air in the dehydrator can simply pass from the entire four trays diagonally. This mainly results in the perfect dehydration of all the food content that are laid over the trays. Also by utilizing the power capacity of 700 watts, this appliance can easily dry out the vegetables, jerky, and fruits by maintaining its quality level. This means you can dehydrate your food in just a few hours that can save your lot of time. ​The Nesco FD-80A Square-Shaped Food Dehydrator possesses an outstanding fan that retains the level of noise to least possible. This powerful fan also helps in faster drying of foods. Since this fan is located at the top, the surplus water from the fruits or vegetables will not be able to damage it. You can also clean this appliance easily. 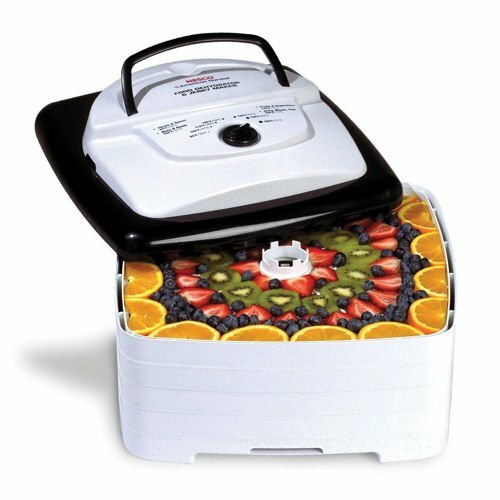 ​This food dehydrator is expandable also i.e. you can increase its number of trays according to the quantity of the food that needs to be dehydrated. Basically, it comes with four trays only but you can expand it up to eight. This can help you during the big parties or gatherings at your home when you required more food. ​Due to its exceptional square design, this alliance also benefits you in providing more area to accommodate extra fruits and vegetables as related to the normal round food dehydrators. This helps you in preparing more delicious snacks for your guests when they arrive at your place. The adjustable thermostat feature of the Nesco FD-80A Square-Shaped Food Dehydrator allows you to dehydrate a diversity of foods at accurate temperatures that range from 90 degrees to 155 degrees. It helps you in getting the best outcomes by safely drying out the edible food items such as jerky or me﻿a﻿﻿﻿﻿﻿﻿t and non-edible food items such as dough, potpourri, herbs, flowers, etc. You can adjust the temperature according to the nature of the food. This appliance has patented Converga Air Flow system that supplies the warmed air uniformly all over every single tray of the food dehydrator. So, you are not required to rotate the trays during the process of dehydration and in fact, the flavors of the different food do not get mix also. ​The Nesco FD-80A Square-Shaped Food Dehydrator is manufactured from an Opaque BPA-free plastic which blocks the light from entering into the product during the process of dehydration. It also benefits in preserving the entire nutrients in the foods during the whole procedure. This food dehydrator belongs to the stackable category i.e. you can increase its size by adding more trays. This appliance compromises of horizontal flow of air during the dehydration process with the help of the top mounted fan. You do not require to rotate the trays at all. The temperature of this food dehydrator ranges from 90°F to 155°F that can assist you in drying out the various varieties of food items. 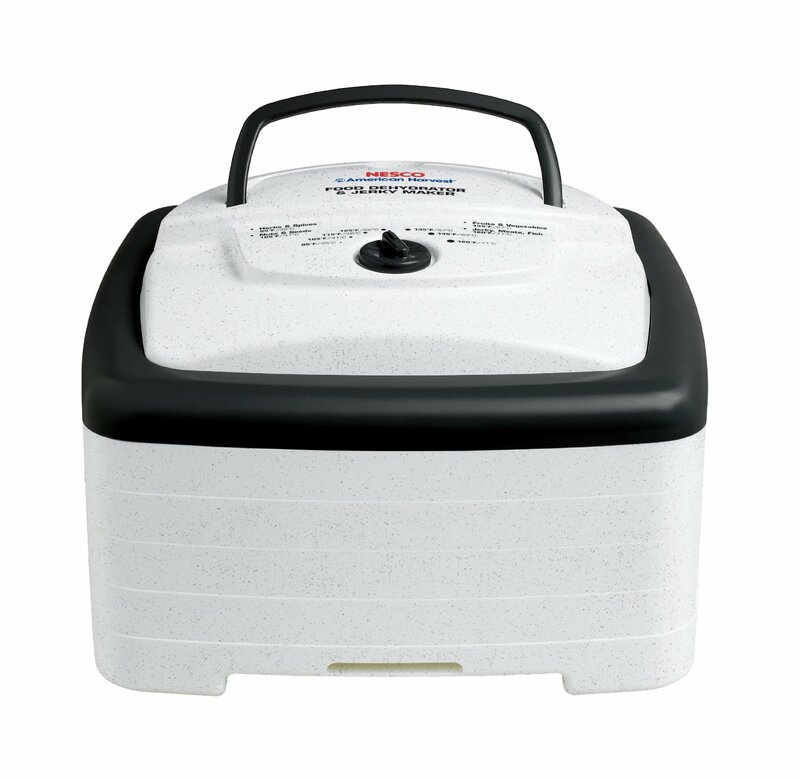 The Nesco FD-80A Square-Shaped Food Dehydrator measures around 14.5 x 14.5 x 9.6 inches. It basically comes with four drying trays but you can expand it up to eight as per the requirement. The power capacity of this appliance is 700 watts that help in fast drying of food in just a few hours. ​The manufacturers of Nesco FD-80A offers one year limited warranty period to its buyers. On the top section of the appliance, an inbuilt bale handle is provided so that you can easily lift the trays whenever required. The buyer also gets an instruction manual book along with the product, so that he/she does not get any problem in using this appliance. This guidebook also guides that how you can take care and maintain this food dehydrator for the longer period of time. The total weight of the Nesco FD-80A Square-Shaped Food Dehydrator is around 9.2 pounds that make it quite easy to carry from one place to another. ​After getting familiar with the outstanding features of Nesco FD-80A Square-Shaped Food Dehydrator, it will be quite beneficial to know the best things about this product. It mainly showcases the advantages of this appliance so that you can know that what benefits you will get if you buy this product for your home. The trays and the accessories of Nesco FD-80A Square-Shaped Food Dehydrator can be washed in a dishwasher so that you can save your lot of precious time. You just have to rub it very softly with a sponge or a wet cloth if any strong stains are there over it. Due to the presence of Converga airflow system and top mounted fan, the heat in the appliance moves over the entire trays so that proper drying of food can be done. So, you do not have to rotate the trays in this appliance as compared to the other in which rotation is required. ​You can dehydrate your food in just a few hours instead of days depending upon the type of food you are dehydrating. The powerful top mounted fan at the top possesses 700 watts of power that offers you the fastest and high-quality dehydrating experience. You can provide a lot of varieties of dehydrated food to your family and friends in very less time. The external body of this appliance is comprised of vita-save feature that particularly designed to block the dangerous light from outside that can decrease the nutritious content value of the food that is under process inside. In this manner, you can get the healthiest snacks in the end. Due to the square design of Nesco FD-80A Square-Shaped Food Dehydrator, you will get more space for drying out your food as compared to the round shape dehydrators. This appliance is manufactured from strong plastic materials that benefit you in preventing the harmful chemicals and toxins from entering into the food during the heating process. Sometimes during the dehydration process of watery fruits, the water gets dripped over the trays and in the appliance. But owing to the top mounted fan in this food dehydrator, the water does not get dripped over the other food. This food dehydrator is manufactured from plastic which makes it look attractive and stress-free to clean. It devises a square-shaped design that makes it more stylish. Over the front side of the product, you can discover a modifiable thermostat key that consists of seven levels of temperature in both Celsius as well as Fahrenheit. There are also recommended temperature details required for the particular food printed on the cover. The Nesco FD-80A Square-Shaped Food Dehydrator does not produce any type of noise while using it for the dehydration purpose. You can easily switch on this appliance before going to the bed and get your favorite dried food in the next morning. Since the size of this food dehydrator is small in size, you can easily fit this unit securely on the countertop of your kitchen. There is no issue of space with this appliance. Due to the presence of powerful motor in this appliance, you can do quick and rapid dehydration of the food items without wasting time. There are several dehydrators that have the less influential motor which takes lots of time for drying out the food. This appliance does not have a power button or a timer. Thus, you are required to plug it in and out according to the requirement. Consequently, the appliance will still function till you disconnect it. So, you must have to pay attention every time you use this product. This results in the inconvenience to the user. Due of the absence of a timer, you might have to purchase additional kitchen timer for your ease. ​Sometimes, it is a bit tougher to dehydrate thicker parts of fruits as well as meats. It cannot dry out them in a perfect manner that makes it stretchy while eating. There are large holes dotted in the trays that make it very difficult to clean screens after using it for the smaller size or semi-liquid vegetables and fruits. So, you have to put an extra effort while cleaning the trays of this appliance. This food dehydrator cannot be expanded more as compared to the other models of the same category. Its expandability is very less if you want to use it for a big parties or gathering of friends. Q: The heating element in this food dehydrator is not working properly. Can it be replaced? If your product is out of the warranty period then the manufacturers of this product will not replace the heating element. Q: Is there any inbuilt timer in this food dehydrator? No, there is no inbuilt timer or power button on this appliance. But you can control the temperature settings. However, you can buy an additional timer for your convenience as it will benefit you a lot during the whole dehydration process. Q: How much number of trays is provided with this appliance? This product comes with the four trays. Q: Is this appliance quiet? Yes, this food dehydrator does not make any noise while the process of dehydration. You can use it even during the night-time also when your family members are sleeping without disturbing them. In fact, in the case of the earlier product, I have to increase the volume of my television, so that the noise of the appliance cannot be heard. But this situation does not arise with this product. Q: My appliance is not getting the start. It means that it is broken from inside? If your food dehydrator is not working after the plug-in, then it must be broken from the inside. Q: What is the power capacity of the Nesco FD-80A Square-Shaped Food Dehydrator? This product comes with the power capacity of 700 watts that is strong enough to provide ample quantity of heat to the food. Q: Will I get a fruit roll up tray along with this appliance? No, this appliance does not come with fruit roll up trays. You will get a screen for drying out the smaller size food items. Q: Does the Nesco FD-80A have an on/off button? No, this product does not have any on/off button that makes it quite irritating for the user. So, you have to plug-in and plug-out the wire to check the status of the food. Q: The advertisement of this product shows that it offers faster drying than the other products that are available in the market. Is that true? Yes, this is true. This product provides faster drying out of the food items as compared to the other models of similar category. Q: Can I leave this food dehydrator unattended during the process? Yes, you can leave this product unattended for around 5 to 8 hours. For example, you can plug it when you are going to sleep and plug it out when you wake up in the morning if you are making jerky for your family. Q: Can the Nesco FD-80A Square-Shaped Food Dehydrator be left below the kitchen cupboards while dehydrating process or does it require to be set up in the open area? It will be advisable to use this appliance in the open area instead of using it in a closed cabinet zone. The reason behind this is that during the process of dehydration lot of heat is produced that needs to emit somewhere. If you keep this product in a closed area, then it will heat up the whole appliance also. Q: Does this food dehydrator manufactured in USA (Unites states of America)? Yes, according to the manufacturer's website, this appliance is manufactured in the USA. Q: Does the jerky press is also given along with this product? No, this appliance does not come with a jerky press. I think using a jerky press over the dehydrated food does not make any sense. Q: Is there any storage board for the cord of the appliance? Is there any storage board for the cord of the appliance? Q: Can I make jerky in this appliance? 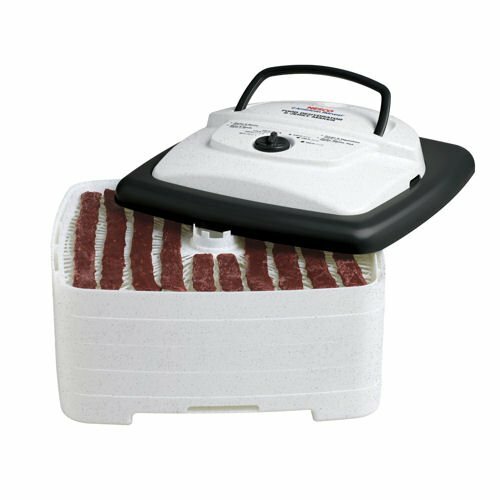 Yes, you can easily prepare jerky in the Nesco FD-80A Square-Shaped Food Dehydrator. Q: My food dehydrator is taking very long time to dry out the two slices of bananas. Is this taking too much time or there is something wrong with my product? According to the instructions book of the appliance, you are required to use all the four trays even if you are not keeping all the food content over it. So, if you are using this appliance as per the guidelines, then you must call the customer care team of the company to solve out your issue. Q: Does the packet of spices and seasoning that we get along with the product are same as the ones we purchase distinctly from the Nesco brand? Yes, the seasonings that you get along with the Nesco FD-80A Square-Shaped Food Dehydrator are from the Nesco brand itself. So, you do not have to worry about its quality. Q: Can I expand this product? This food dehydrator is expandable up to eight trays, so you can expand it when you want to dehydrate more food items for your family and friends. Q: What is the warranty period that is offered on Nesco FD-80A Square-Shaped Food Dehydrator? The buyers of this product will get one year limited warranty offer along with this food dehydrator. Q: I am a new buyer of a food dehydrator. I don’t know about using this product. So, who will guide me in this context? Even, if you are a new buyer of this food dehydrator, you do not have to worry about using this appliance since it is very easy to use. You will get an instruction book along with all the guidelines that need to be followed step by step for the proper functioning of this appliance. Overall, the Nesco FD-80A Square-Shaped Food Dehydrator is the best appliance in the terms of quality as well as design. Due to its compact size, it can be effortlessly fit in a small countertop area of your kitchen. You can easily clean and maintain this product without any issue that you might get in other appliances. This food dehydrator will also help you in preparing healthy snacks for your family and friends. According to our opinion, this particular product is perfect for the smaller families owing to the capacity it offered. However, we cannot deny it few shortcomings, but besides those flaws, it still functions quite efficiently. ​All things considered, the Nesco FD-80A Square-Shaped Food Dehydrator is amongst the most recommended models that are available in the market at present. Due its incomparable ease of use and remarkably reasonable price, this appliance constitutes of all the necessary things that you required for the faster and quick dehydrating of your food. So, you shouldn't miss your chance of buying this ultimate product for your kitchen that will surely benefit you and your family in the long run.